Interested in becoming a civil service government accountant? JobTestPrep is here to help you with the civil service accounting exam by providing you with our practice resources, tests, and detailed explanations of the test content and process. Prepare yourself today for your civil service accounting exam and apply with confidence. Which Accounting Test to Take? Job vacancies are offered in accounting for state and local governments as well as for federal accounting jobs. Each classification contains its own specific subjects on the civil service accounting exam that pertain to that position. JobTestPrep offers position specific practice packages, in addition to an all-inclusive accounting preparation pack that covers all accounting positions. 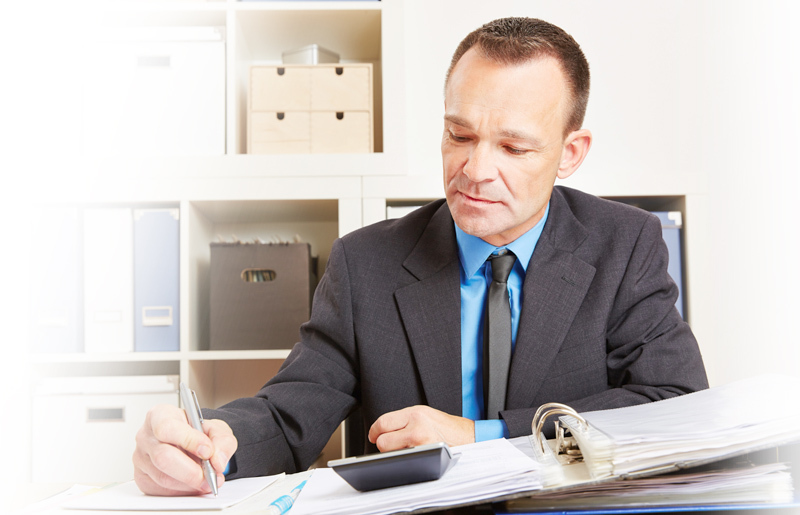 The civil service Accounting exam is a multiple choice test, administered either as pen-and-paper or computer-based, and is offered for numerous governmental entry-level and higher level accounting type positions. Each state provides information about the test duration, number of questions, and test subjects on the exam announcement for the job vacancy. View our comprehensive outline of the government accounting test subjects you may find on your exam; find yours and begin studying. Almost every accountant-type civil service exam contains questions on basic accounting principles, terms, bookkeeping and office methods. Candidates must be familiar with these topics understand their meanings. Some government accountant exams contain questions requiring candidates to be able to solve accounting problems that may typically arise on the job, such as issues related to interest, financial analysis, and depreciation. Arithmetic with Calculators: this section contains basic arithmetic computations, testing candidates’ skills in mathematical knowledge and reasoning. These government accounting test questions consist of addition, subtraction, multiplication, and division, as well as the calculation of decimals, averages, percentages, and rate-distance-time. Certain questions may be presented as text-based word problems instead of math computations, requiring candidates to read the sentence/short paragraph and identify the necessary computation. This section is a vital portion of the Civil Service accounting test as well as to the general requirements of the government accountant job. Arithmetic without Calculators: depending on the authority or state, a calculator may or may not be allowed on this section of the exam. If a calculator is prohibited, then the presented arithmetic problems will be simpler than those allowed to be solved with a calculator. Questions in this section of the government accountancy exam are designed to assess candidates’ knowledge of basic booking concepts and practices. Candidates must be able to recognize and show an understanding of bookkeeping terms, be able to record financial transactions, and identify the correct entry for certain transactions. This section of the accounting test requires high critical thinking skills from candidates. Data is presented in tabular or graphical form and must be analyzed and understood. Questions may require the completion of tables or graphs, drawing logical conclusions, analyzing data trends, and revising/combining sets of data. Here, concepts of rate, ratio, and proportion may be tested. Candidates must process complicated information and apply it accurately. For candidates applying to an accounting clerical or assistant positions, this section requires them to be familiar and skilled in certain systems and operations with letter and numbers. These consist of specific instructions that may involve alphabetizing, comparing, checking and counting. Reading Comprehension: These questions may present several reading passages and require candidates to read, understand, and draw logical inferences from said passages. No external knowledge is required, as all the information necessary to answer the questions is given in the passage. Grammar and Sentence Skills: These accounting questions generally require candidates to clearly and accurately organize sentences or paragraphs that are out of order into a logical, comprehensible sequence. Other questions present a set of information or sentences, requiring candidates to choose the best restatement of the given information among the four answer choices. This skill is necessary for success on the accounting exam and on the job itself. Candidates are tested on their organizational skills and ability to collate data from multiple sources. Items may include questions on scheduling, maintaining a record system using running balances, and summarizing data using totals, subtotals, averages, and percentages. Certain Civil Service Accounting Exams contain questions pertaining to the supervisory or managerial abilities of the candidate. Candidates must be familiar with the principles used in planning and organizing the activities and schedules of a work unit; they must be able to properly communicate, motivate, evaluate performance levels, maintain certain work standards, increase efficiency, employ discipline, and facilitate change. Questions of this sort are typically presented in a situational judgment question format; a certain situation or problem is given and the candidate must choose the best reaction or response from the answer choices. These questions focus on practices and interactions between supervisors, evaluating the performance of subordinates (staff and supervisors), and maintaining relationships with other work sections. Candidates for this level of accounting governments jobs must be able to assign work and duties to subordinates, coordinate the activities of several work units, and establish and guide programs. If you feel that your accounting skills are not up to par, don’t take the risk. Most states require a passing grade of 70% to even be considered to continue in the hiring process. In order to fully prepare you in face of your government accounting exam and get you the score you want, JobTestPrep offers online accounting practice packs which were carefully compiled to refine your knowledge and skills and give you a comprehensive understanding of the test questions. JobTestPrep offers a Civil Service All-Inclusive pack which gives you 12 months access to all our available civil service preparation packs. The All-Inclusive pack gives you the preparation package in an organized manner, separating the questions by exam allowing you to study only the material you need instead of learning information that will be of no use to you.